Dan Jones was born and raised in Fargo, ND. He studied art history at North Dakota State University. Jones is best known for his panoramic oil paintings, but has been actively involved in art creation and retail for most of his life. His works are found in corporate, museum and private collections throughout Europe and the United States. 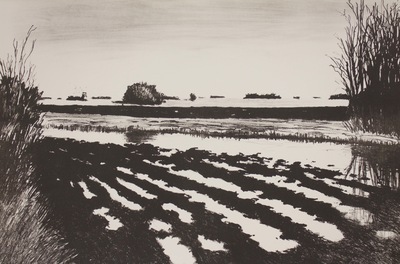 This artwork was produced for the Overlanders portfolio: a portfolio of ten prints by visiting artists at the University of North Dakota. UND professor Kim Fink developed the portfolio.